There’s nothing like digging deep to remind you that you can indeed get the job done. And as with every situation this season that’s worthy of celebration and happiness, there is always a grim reminder of the fact that it shouldn’t be celebratory because it should be ordinary; this is the kind of win that we should be able to pull off in our sleep. And as with every grim reminder of the fact that it shouldn’t be celebratory because it should be ordinary, there is always another grim reminder of the fact that the reason why it’s celebratory is because it’s so rare these days. Buchholz was the first to dig deep. He allowed two runs on a double in the first and one run on a solo shot to lead off the second, and that was it. He was lights-out for the rest of the game, which he almost pitched to completion. Aceves ended up coming out for the ninth, during which he retired the side and got the save. 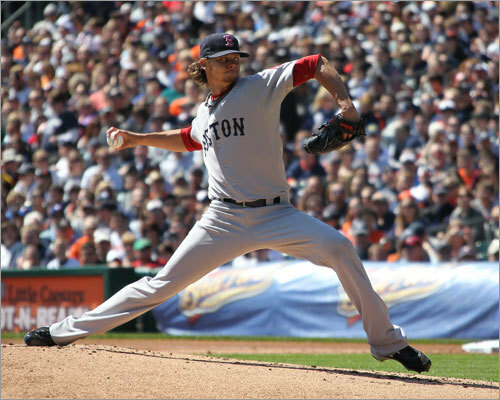 But Buchholz was in absolute top form when he was on the mound. He owned the Orioles when he was out there. He had their number all the way through and didn’t let them gain an inch after that second inning. He just kept his head down and did it, and in so doing he set an example that should be followed immediately. My favorite inning was by far the sixth. He retired the side. With strikeouts. On a total of nine pitches. That means that every single pitch he threw that inning was a strike. Curveball, curveball, cutter, four-seam, cutter, four-seam, four-seam, cutter, splitter. One, two, three. No chance, no chance, no chance. It was ridiculously awesome. There was absolutely nothing the Orioles could do against him. As the game went on, he kept getting better, and they just couldn’t figure him out. So he ended up walking three and striking out a grand total of seven and throwing 107 pitches, seventy-two of which were strikes. He allowed a total of eight hits, four of which were for extra bases, three of which were doubles, the fourth being the solo shot. But Buchholz would never have gotten the win if the hitters hadn’t also dug deep. We did everything the Orioles hitters weren’t doing: wearing out the starter, being patient at the plate, getting deep into counts, and making him throw a lot of pitches. We scored our first run in the second, when Punto walked and scored on a single by Podsednik, who’s back in Boston. At the time that simply reduced our deficit to one; it didn’t tie the game or put us ahead. In fact, after Buchholz allowed the solo shot, our deficit was back up to two runs. So we needed more. And that’s exactly what we got in the fifth inning. Ellsbury provided an out to start it off, but then Crawford singled, Pedroia doubled, Crawford scored on a wild pitch, and Pedroia scored on a sac fly by Gonzalez. We put the finishing touches that would become the game’s final score in the sixth. Podsednik doubled, Ellsbury walked and was out at second on a force out by Crawford, Podsednik scored on a single by Pedroia, Crawford scored on a single by Gonzalez, and Pedroia scored on a single by Ross. So the game ended with us on top, 6-3. Gonzalez and Podsednik both went two for four, Crawford and Pedroia went two for five, and Ross went three for five. Most importantly, it was a team effort. We won because the team dug deep. If only the team always digging deep were enough. So, how many times have we seen this? It’s a classic story. Pitcher makes bid for no-no. Pitcher gets halfway through game with no-no. Opposing team takes solace in the fact that, if they can manage to scrape together just one hit, pitcher will implode completely after losing bid. Pitcher gives up first hit. Pitcher does indeed implode completely after losing bid. Team on receiving end of win ends up losing. And I know that story because that’s the exact same story I root for every time I even think we might actually be the victims of a no-no or some such outcome. Fortunately, in that situation it comes through for us almost every time, and certainly in recent memory. But when your pitcher is the one making the bid and then losing it and imploding, suddenly the story means something very different. It means a regular old loss instead of a loss that at least represents the recovery of your dignity. When Cook was in business, Cook was in business. His bid lasted for five innings, and he actually had a perfect game going through the fourth, when he gave up his first of three walks. He gave up his second walk an inning later. He had the Orioles wound around his finger and did with them as he pleased. They all stepped up, and he sent them down in every way you could possibly send a batter down. He mowed through that lineup like it was a lawn in need of some serious grooming. And he did it precisely and efficiently to boot. And then came the sixth, and it was like he completely transformed right in front of our eyes. Actually, scratch that; he did transform right in front of our eyes. From a good pitcher to a bad pitcher. He gave up five runs, but he’s lucky he didn’t give up much, much more. After securing the inning’s first out, Cook gave up his third and final walk, his first hit of the night in the form of a single, and then his second in the form of an RBI single. His next hitter ended up reaching on a force attempt; Cook made a throwing error, and that brought in another run. Then Cook gave up a double that scored one. And that was when he was replaced by Miller, who began his workload with a fielder’s choice out at home that also resulted in a baserunner. That was it for Miller, and Tazawa came in and gave up a double that scored two followed by a single, which was when he was replaced by Breslow, who finished the inning and pitched the seventh as well. Mortensen pitched the eighth. As far as the offense is concerned, we were busy matching the Orioles pitch for pitch, which in this case means not hitting anything for the first half of the game or so. We scored our first run in the fifth; with one out, we hit back-to-back singles and scored one run on a double by Ellsbury and the other on a sac fly by Crawford. So at the time, we were up by two. Then the sixth inning happened. And then we scored our last run in the seventh, when Punto reached on a fielding error, advanced to third on a deflected hit by Ellsbury, and scored on a sac fly by Crawford. That was all we could muster. So the final score was 5-3. We could really have used the galvanizing effects that a no-no always brings with it. If you thought things weren’t bad already, they’re really starting to get bad now. Gonzalez and Bobby V. were both ejected in the eighth because Gonzalez argued that he was quick-pitched. And you could just tell that they and the rest of the team are tired, frustrated, and wanting so badly to just win but for some reason not being able to do it consistently. Let me start off by saying something truly painful, something that I had been hoping not to have to say. I speak for all of Red Sox Nation when I convey my condolences to the Pesky family. Johnny Pesky passed away on Monday after a long and fruitful life filled with family, friends, and the fraternity of this team, whose uniform he was able to wear for sixty-one years. He saw this team at its best and its worst. He was a Teammate as well as a recipient of a 2004 World Series ring. He played in Boston in an era of the game that saw its greatest players of all time; he was part of a team that came just short of glory in 1946, an experience that would become all too well known in this city until the dawn of a new millennium. To his credit, he has a career batting average of .307, an on-base percentage of .394, a slugging percentage of .386, 594 double plays, a fielding percentage of .966, an All-Star distinction, a truly diverse set of roles within the organization, a place in our club’s Hall of Fame, a proud record of military service to this country, a retired number, a foul pole at America’s most beloved ballpark, a reputation for being one of the classiest men to play the game, more than six decades of service to this organization, and the love, devotion, and loyalty of a Nation. Because he had nothing but love, devotion, and loyalty for this team and for us. Nobody loved this organization more than he did. He lived and breathed it for his whole life. As a Nation, we participated in a moment of silence yesterday, and together we grieve for this loss but know that his spirit will live on; in a way, the fact that the season continues, game after game, is a tribute to that and to him and his dedication to baseball. He touched the lives of many with his playing ability and his outstanding character. Words can not express what he has meant to this organization, to this team, and to us as fans. We miss you, Johnny Pesky. And we salute you. We lost again yesterday. It was a complete and total mess. The Orioles basically walked all over us. Beckett allowed six runs on six hits while walking two and striking out two over five and one-third innings. He gave up a solo shot to lead off the third, another one to lead off the fifth, and then a veritable mess of runs before and after he was pulled in the sixth. He allowed a single, somehow got the inning’s first out, issued a walk, allowed both runners to advance on a wild pitch, and then gave up two RBI singles. Melancon came on in relief after that and gave up a three-run home run, which allowed his two inherited runners to score. He ended up pitching the rest of the game without incident, but that home run was really the beginning of the end for us last night. Our prospects to win this game were promising for a grand total of five and a half innings. We scored our one and only run in the fourth: Ross doubled to lead it off, moved to second on a groundout by Lavarnway, and scored on a single by Crawford. That was it. At the time, it tied the game at one. Even when Beckett gave up his second solo shot of the night, we were still only down by one. It was the one bad inning that reared its ugly head and deprived us of the win. I would say our greatest opportunities to make more of a dent came in the third, fifth, and sixth. In the third, we had two on with two out and Gonzalez flied out to end the inning. Pedroia tripled with two out in the fifth, and it was again Gonzalez who ended the inning, this time with a groundout. We had two on with two out again in the sixth, and it amounted to nothing. We had the bases loaded thanks to a single, a double, and a walk in the seventh with only one out, and it amounted to nothing. So the final score was 7-1, even though we out-hit them, 11-7. Alright. That’s the way to play. We jumped out early and never looked back, and I mean never looked back. Even in the fifth, which was our hugely colossal inning at the plate, the game had already essentially been blown open. It was just amazing to watch. We were so dominant that we looked like a completely different team than the one that loses in every way, on every day of the week, with every hitter, behind every pitcher, and by every final score that you could possibly imagine. That team didn’t show up to the field yesterday. Yesterday we were different. In a good way. We need to see much more of that. In a rare occurrence, both the hitters and the pitchers deserve the spotlight, but I’ll start with the hitters first since they began the game for us because we were away. Ellsbury grounded out, which should not at all have been an indication to the Indians of how yesterday’s game was about to go down. Crawford doubled after that and scored on a double by Pedroia, who scored on a home run by Gonzalez, which he smashed to right field like it was the easiest and most natural thing in the world, like he gets up there and does it in every single at-bat, like it was no big deal and anyone who isn’t doing it has something wrong with him. Lester began his start by giving up two straight singles, one of which turned into a run one out later on a sac fly. But we got it back and more in the second, when Aviles and Ellsbury both singled and scored on a double by Crawford. Neither team scored from the bottom of the second through the bottom of the third. Aviles led off the fourth by getting hit, and then he scored on a single by Shoppach. That was when the Indians thought that, maybe if they made a pitching change, their fate for yesterday’s game, which I assume they had begun to sense, would change. It most certainly did not. Lester went one-two-three in the bottom of the fourth, and then we scored eight runs in the fifth. You read right. That’s eight runs in the fifth inning alone. We scored more runs in that inning than we often have scored throughout whole games this year. We scored more runs in that inning than we often have scored throughout several games this year during particularly bad stretches. And just like that we scored eight runs. Like it was the easiest and most natural thing in the world, like we get up there and do this in every game, like it was no big deal and any team that isn’t doing it has something wrong with it. Pedroia singled, Gonzalez walked, Pedroia scored on a single by Ross, Gonzalez scored on a single by Salty, Aviles walked, Ross scored on a sac fly by Danny Valencia, Shoppach struck out for the first out of the inning by which point we had already scored three runs, Salty and Aviles both scored on a double by Ellsbury, Ellsbury scored on a double by Crawford, the Indians made a pitching change that made absolutely no difference, Pedroia walked, Crawford and Pedroia both scored on a double by Gonzalez, Ross walked, Gonzalez and Ross both moved up a base thanks to a passed ball, and then the inning ended when Salty flied out. Neither team scored for the rest of the game. It was like we were sated and they were stunned and had absolutely no idea what to do and couldn’t make any sort of move whatsoever. Lester, for his part, was brilliant. He pitched six innings and gave up just the one run on three hits while walking two and striking out a grand total of twelve! No pitcher in our uniform has struck out that many since the last time Lester struck out twelve, and that was back in 2010. I’m telling you, it’s so good to see that double-digit number in his K column again. That’s been way too rare a sight this season. Eight of the strikeouts were swinging, and four were called. You better believe that his cut fastball was as nasty as I’ve ever seen it and was playing tricks on the hitters all afternoon long. It was glorious. It was vintage Lester and reminded me of all the goodness to which we unfortunately haven’t been privy this season. Tazawa pitched the seventh, Mortensen pitched the eighth, and Aceves pitched the ninth. Lester picked up the win. All told, we put up sixteen hits. Half of those were for extra bases. Five members of our starting nine had multi-hit performances, and only one went hitless: Valencia, who still brought in a run with a sac fly. 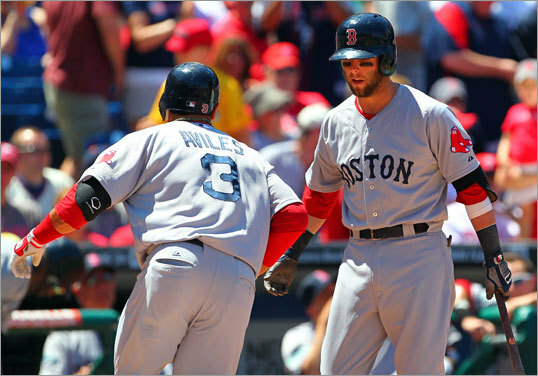 Ellsbury went two for five, Pedroia and Gonzalez went two for three, Crawford went three for four with three doubles, and Aviles had a perfect day at the plate with a three-for-three performance. The final score? 14-1. They had nothing on us all day long. This was one of those nights where we trotted out the staff and didn’t win because the offense didn’t do a good job of providing much support to speak of. It was one of those nights where we played mediocre baseball at best and couldn’t just be good enough to get ourselves a win. It was one of those frustrating, long nights where we all knew where it was going. In short, it was basically just like any other night. It basically came down to the fact that we did not score a quantity of runs that could be counted on to be enough to get us through to the W. Maybe in another season when our pitchers return to their usual glory, it would have been enough, but not here and not now. We went down in order in the first three innings and scored all two of our runs in the fourth. Ellsbury doubled, Crawford singled on a bunt, and Pedroia reached on a fielder’s choice to load the bases with nobody out. What we needed was a grand slam, or at least to score more than two runs. What we got was a double by Gonzalez that brought both Ellsbury and Crawford home. Pedroia tried to score but was thrown out at home. All else being equal, though, we would have lost anyway even if he scored, which doesn’t say much of anything about our pitching staff. 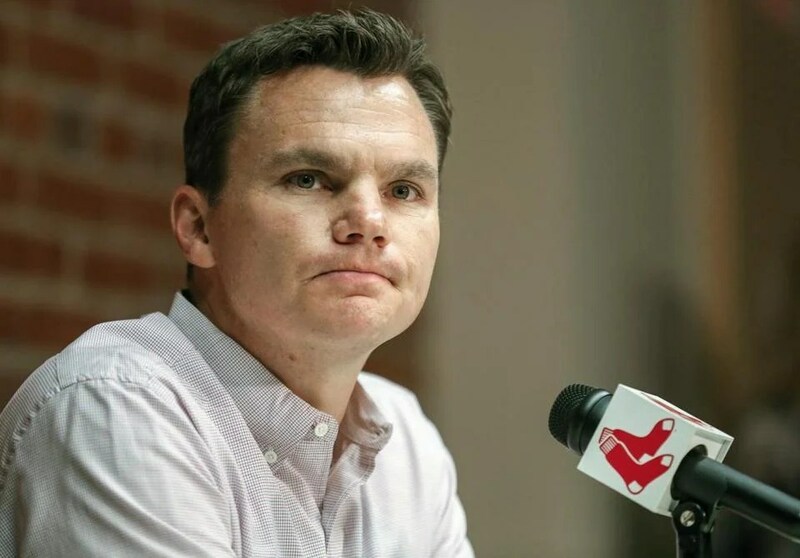 Speaking of, since we can move on because we went down in order in the rest of our innings except the ninth when we sent up one above the minimum because Pedroia singled, we sent out five pitchers. That’s a lot of pitchers. I mean, it’s not the most I’ve seen us roll out in a single game, but considering who’s been set free and who’s been placed on the DL, it’s still a lot. And none of them seemed to really have the answer. Morales started and took the loss. He pitched five and one-third innings and gave up three runs on two hits. He gave up a solo shot to lead off the third, a walk and an RBI single in the fifth, and then an ugly stretch in the sixth that featured a walk, a hit batsman, a double steal, an intentional walk to load the bases, a pitching change to Miller, and then fortunately nothing more than a sac fly. It was fortunate because at least we didn’t lose by that much, thereby preserving some dignity. So if you think about it, Morales didn’t pitch badly at all. On the contrary, if the relievers didn’t allow their runs, we would have lost only by one, all else being equal. A loss is a loss, but in terms of morale, it makes a difference. Anyway, Melancon replaced Miller after that but then gave up a double and a sac fly in the seventh. Breslow them came on for the eighth and gave up a double and an RBI single, after which he was replaced by Mortensen, who was the only one of our pitchers to not allow a run to score, although he was only out there for one batter, so who knows? Perhaps if he’d had to pitch to additional hitters, he may have gotten in on that action. Oh, yeah. Look for Middlebrooks to be out for the rest of the season with a broken right wrist. That’s great. That’s just great.